I learned this tip from students at the Auguste Escoffier School of Culinary Arts, where I teach preserving classes to students in the Farm to Table Experience. Skip trying to carve the skin off your ginger with a paring knife; you’re likely trimming away valuable ginger. Instead, take a teaspoon and scrape downward with the tip of the spoon (where you eat from) in small strokes as if you’re whittling. 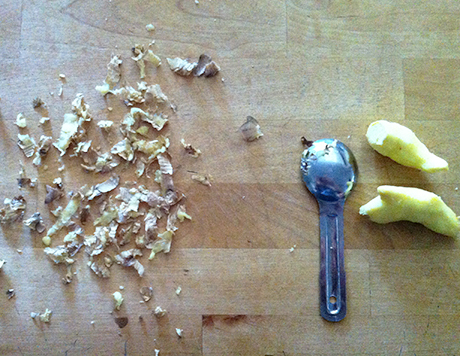 Ginger freezes well, peeled and unpeeled, and you can use this peeling tactic with a frozen hunk of ginger as well.